"I Could Never Tell" by A. Dawn is a newly published Kindle ebook available at Amazon. Check it out and leave your comments below or create your own review. 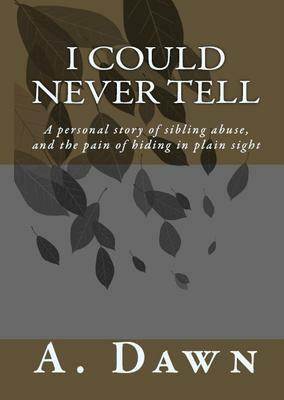 This is a true story of a survivor of sibling abuse. As a small child, I always dreamed of the day I would finally meet him. I imagined what he looked like, and how his personality may be. One year, I even left a gift for him under the tree for Santa to take and give to him wherever he may be. My mother had lost custody of my half-brother when he was just a newborn, he was placed in foster care and adopted by another family, and none of us were to ever see or speak to him until he reached the age of 18. Despite my expectations of what meeting him one day might be like, there was no way I could ever prepare myself for the horrible physical and sexual abuse that would occur.